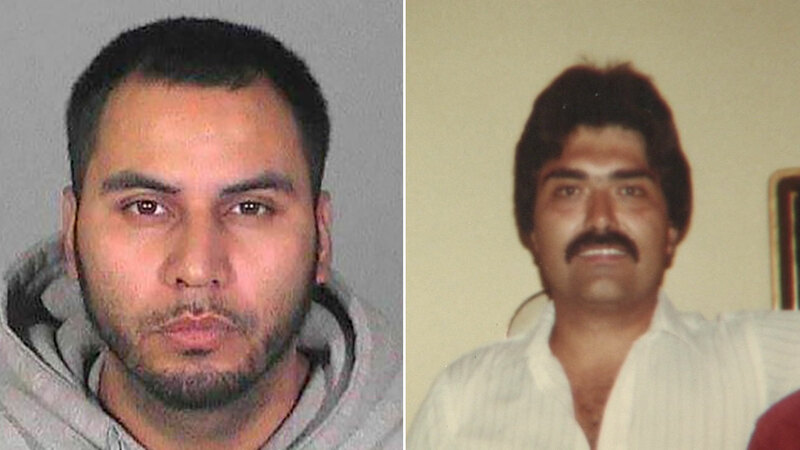 Police say Randy Marquez, 30, (left) fatally struck Victor Gallegos, 58, (right) near Pickering Avenue and Hadley Street in Whittier on Saturday, March 19, 2016. WHITTIER, Calif. (KABC) -- A man sought in connection with a hit-and-run crash in Whittier that left a 58-year-old Army veteran dead has surrendered to police, authorities said on Wednesday. Police say Randy Marquez, 30, fatally struck Victor Gallegos near Pickering Avenue and Hadley Street around 9 p.m. Saturday. Authorities found Marquez's pickup truck parked in the 2200 block of Ruiz Place in Hacienda Heights Sunday. A Toyota truck believed to have been involved in a hit-and-run crash was found parked in the 2200 block of Ruiz Place in Hacienda Heights Sunday, March 20, 2016. The Whittier Police Department said Marquez turned himself in to authorities at the Glendora Police Department Tuesday night. He was booked on suspicion of felony hit-and-run and a parole violation hold. Gallegos' wife of 26 years says he served in the Army as a combat medic and was a proud veteran. "Victor was kind and caring and loved everybody that he met," Gloria Gallegos said. The investigation is ongoing. Anyone with further information was asked to contact Whittier police.